Despite his solo success and work within Genesis, Steve Hackett has yet to have an official documentary about his career made. This glaring oversight has now been amended with this brand new production: Steve Hackett – The Man, The Music. A documentary several years in the making, it compresses a 40 year career and personal life into over 2 hours and 20 minutes. With an arsenal of musicians and peers including lot’s of new interviews and insights, the documentary aims to be a definitive biography on film. Opening with an establishing shot of Steve’s Map Studio in Twickenham (recently sold) where the sound of roaring electric guitar emanates from within. It cuts to Hackett upstairs in his studio noodling on his Black Burny electric guitar. Instantly, it is apparent that this is no ordinary documentary about a musician; this is a documentary about Steve Hackett. The clip continues with Steve introducing some delay via his Line6 DL-4 pedal and then the title screen appears, Steve Hackett – The Man, The Music. As openings go, it is a rather subdued approach that avoids the traditional and lazy barrage of clips of interview snippets out of context. 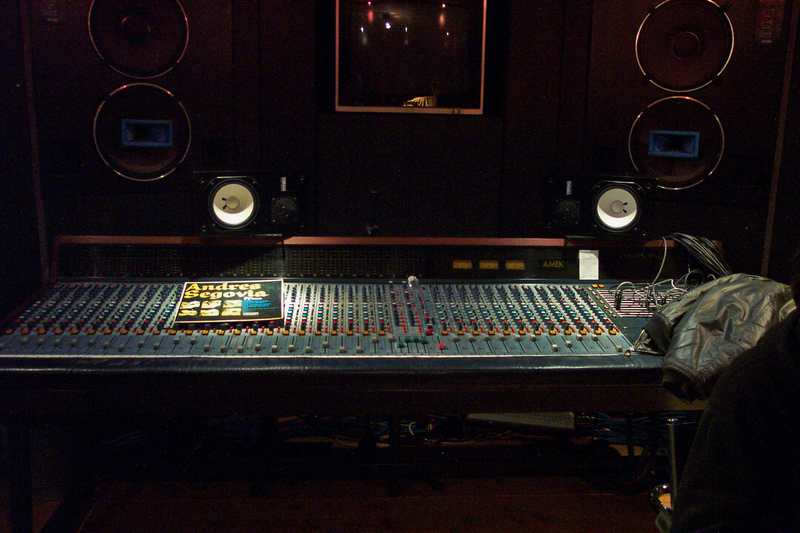 Steve Hackett’s Amek mixing desk with Andre Segovia Plays Bach LP © Copyright TEJ 2003 to 2015. Filmed over a 5 year span there are many different interviews with the man himself throughout. After the title screen it cuts to Steve chatting with long-term engineer Roger King in a humorous conversation about Steve’s parentage. Generally, the interviews take an exceptionally light hearted approach, or conversely heartening honesty. Introducing the chronological convention to a biography, we flashback to Steve’s childhood with a shot of the looming Battersea Power Station – the backdrop to his time growing up. Steve and his mother June appear on camera discussing this period followed by further tales recounted by Steve and his wife Jo. They discuss an amusing incident that Steve remembers from his younger days involving an unexpected dip in a fountain. This breaks the chain of some documentaries that rely solely on either the mystical musicianship and aurora of the artists, or worse those that want to dig at the dirt. Instead it comes across as earnest and an embarrassing tale, but one that humanises Hackett. Of course you get to hear Steve talk at length about a talent he is less recognised for, his harmonica playing. Whether it is Steve learning to play the harmonica at school, or talking with his equally talented brother John about their inspiration to buy a flute after witnessing the great Ian McDonald with King Crimson, the documentary fills in gaps and tastefully paints a picture of a determined teenager studying the musicianship of the great players of the time. Nevertheless, the documentary isn’t entirely linear and at this point in the tale of Steve’s life we jump forward to footage of a live show at Leamington Spa with Myopia/Los Endos playing. Also featured are backstage interviews from the show in Tammy Wynette’s gypsy caravan. (This show is in fact reviewed on this site here and I can personally attest to the beauty of the caravan.) Steve and his touring band at the time (Nick Beggs, Gary O’Toole, Rob Townsend, Amanda Lehmann) are interviewed in the caravan as well as his brother John. These interviews are exceptionally light-hearted and show the affection and humour of the band. It wouldn’t be a look at Steve’s musical career if there wasn’t a masterclass of classic “Hackettisms” on guitar. Returning back to Map Studios, Steve sits positioned in front of the Amex desks and delivers a slice of a masterclass to the viewer in detail. A fact known to guitarists but less known to non-players is Steve was arguably the pioneer of tapping, and demonstrates this technique among many others of the tips and tricks he has in his arsenal; including a bit of a rig breakdown. Some players closely guard their exact sound, but Steve is refreshingly transparent in explaining where these ideas developed from. This documentary is not a classic albums blow-by-blow of each song or album, but it is about Steve Hackett. Candidly discussed is some exceptionally personal history in the form of his first marriage which subsequently ended during the Lamb Lies Down Tour. Of course, Genesis are mentioned. The documentary avoids focussing solely on the brief six years and eight months, especially an area that is covered extensively elsewhere. The focus is drawn towards Steve solo albums, starting naturally with Voyage Of The Acolyte. Retelling stories from the sessions at Kingsway House, some pertaining to Mike Rutherford and Phil Collin’s contribution to the album, there is enough to satisfy casual fans and diehard gear heads. The lead line from Ace of Wands gets a particular mention, as does Hands of the Priestess, which John Hackett also contributed on. Otherwise Genesis is a brief bullet point in a career much longer outside of it. This might explain the lack of any member of Genesis in terms of interviews/talking heads style soundbites or quips, but it doesn’t detract from the documentary subject. It feels strange not seeing any input from Nick Magnus or any other former solo band member, yet it could be argued that the documentary needed a contemporary feel with the musicians that Steve works with presently. Steven Wilson discusses Voyage Of The Acolyte and other albums. Steven is a big fan of Steve’s work, he is also the remix and surround sound engineer on the forthcoming Premonitions Box Set. Unfortunately, there is little archival footage shown in the documentary. The reality is licensing for footage comes with a heavy price tag and realistically the documentary would not have had an infinitely huge budget. It could be argued would footage like Montreaux 1980 interspersed in the documentary add anything extra when the live performance footage filmed at The Assembly Hall in Leamington Spa in 2010 covered Steve’s performance prowess and that of his current band ideally anyway. However, it is great to some of the early student films Steve starred in. What the documentary lacks up for in historical film it makes up for in thorough detail and candid interviews. In a world of glossy PR and management, there are certain topics that were unexpectedly addressed and yet were edited in with little furore that it catches you off guard. Without sounding like a tabloid vulture, it is intriguing to see Steve address these contentious themes; you’ll have to watch the documentary to find out exactly what they are. The 1980’s Super group GTR is treated as a pit stop, but that is not a major issue. The documentary covers further areas before the recently deceased Chris Squire bassist of Yes sits at Steve’s dinner table discussing with Steve how they began working together on several projects, including the recent joint project Squackett, A Life Within A Day. A poignant moment seeing Chris talking about how he enjoys working with Steve. We should mention the cut of the film sent to TEJ for reviewing was not entirely finished, this we accepted as a rough edit. Generally the documentary is lead by the power of the interview and the quality of the subject matter. Nevertheless, the production level isn’t always the highest and some of the edits are sudden and pace breaking. The overall content of the interviews is rich and broad with an emotional core throughout. Personally it would have been interesting to have seen the Sketches of Satie album from John and Steve discussed by the both of them, I feel this would have tied the story of their working relationship to the modern age rather than just the 1960’s to 1970’s which is all that is mentioned from John in the documentary. Vast amounts of Steve playing in his studio and demonstrating his playing and techniques. Live footage from Leamington Spa – 21st November 2010 (albeit not soundboard audio). The length of the documentary is over two hours of information about Steve and it touches almost every aspect of his career. It might gloss over certain areas rather quickly, but there is usually a good reason for that. Genesis fanatics might be annoyed at the short time focused on the band but they could look elsewhere for that fill, in particular the VH1 Archive Box Set 1 documentary. This is a documentary that would appeal to a broad spectrum of fans both new and old the documentary. Humorous, entertaining, personal, honest, and not tarnished with an attempt to stir up trouble. Furthermore there is an extra 11 minutes in the form of a DVD extra that is a Chris Squire interview something we have not seen on our preview copy. We’ll look forward to that on the finished product. Roger and Steve talking the studio is a masterclass in dry wit. Nick Beggs talking in the gypsy caravan is a masterclass in surrealism. The masterclasses dotted throughout on different techniques and guitars are great for keen amateur guitarists. The honesty that is provided by the remaining interview subjects, its refreshing and shows that Steve is a great team leader and head hunter. The archival material is insufficient and not in the best quality, a shame compared to the collection of many individuals who could have contributed bountiful amounts to add an interesting number of bookends to each section. Whereas video is expensive to license, tickets and other memorabilia could have been supplied by fans for example. The harsh reality is there is no new archival material which will disappoint those expecting it. The documentary could have benefited from having a different set of eyes at times instead of one person who was trying to do three roles at once in the form of Cameraman, Director and Editor. Whist one could assume this route was chosen for either budgetary reasons or quality control reasons. In this example some of the edits are jarring and the chronology could have been tweaked to prevent it skipping sections and then jumping back. Overall it acts as a great precursor to the upcoming Premonitions Boxset whilst telling a fan of any ability or depth the rich tapestry of The Man, The Music. Thank you to Jacob at Wienerworld for your help and assistance.